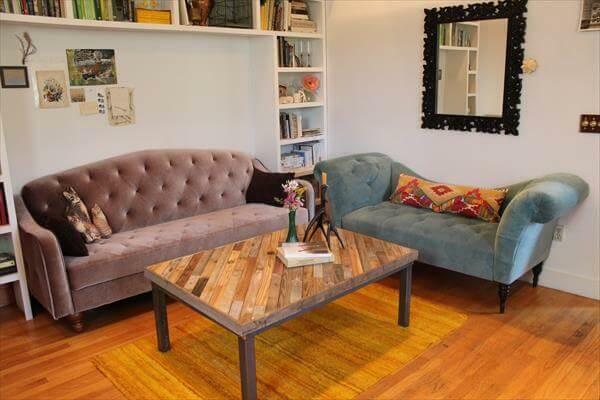 Pallets are getting high fame due to their so much inclusion in home improvement and developments! 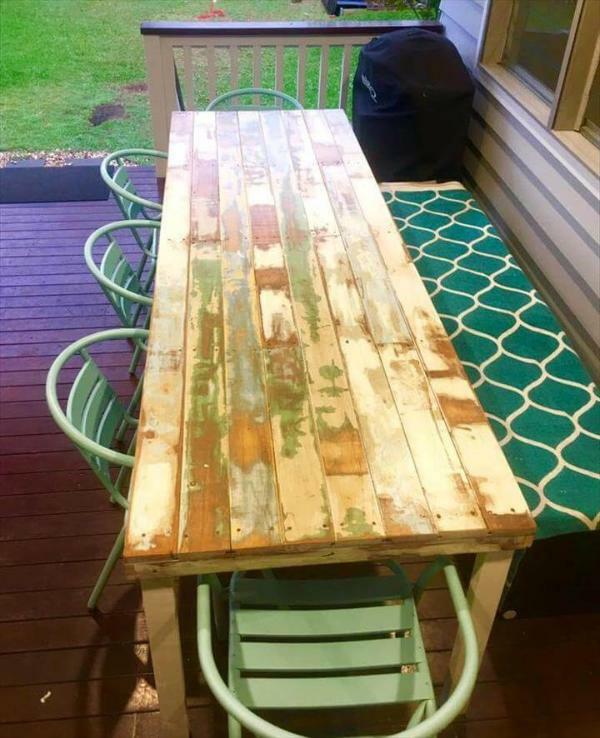 A one more big reason behind their so raised popularity is that it is always cost-effective to do some DIY pallet projects! 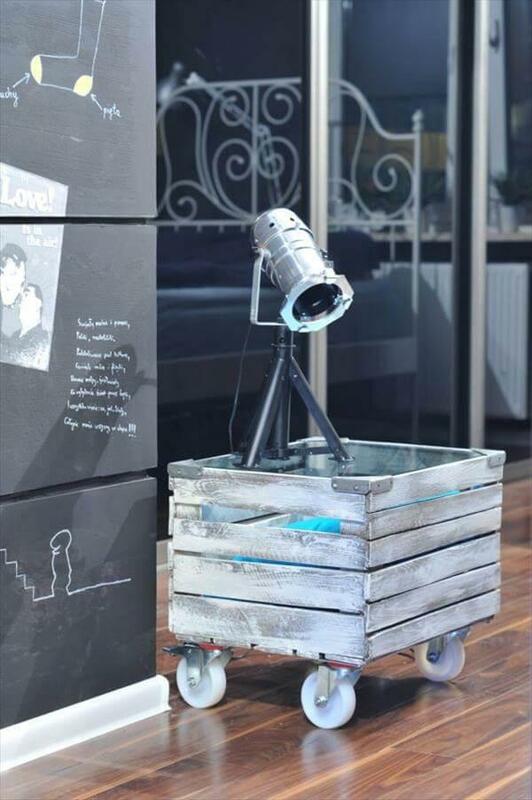 If you are also in touch of pallets and really brainstorming to do more innovative projects with them, then wait is all over, a little visit of these 30 DIY pallet ideas will truly inspire the creative DIYer in you! 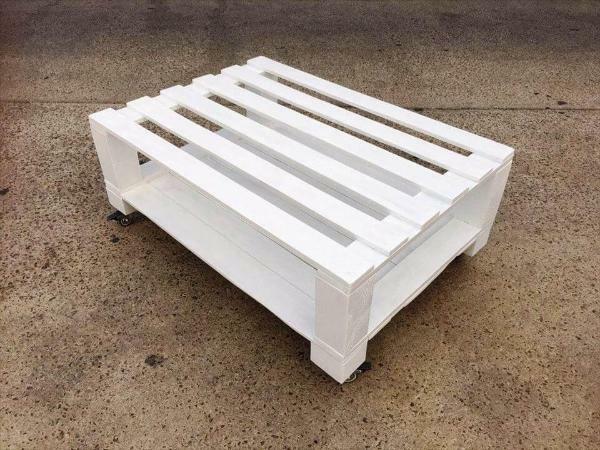 These pallet ideas show that pallets are much more than just being the packaging material and are not going to be considered a wood waste in any way! 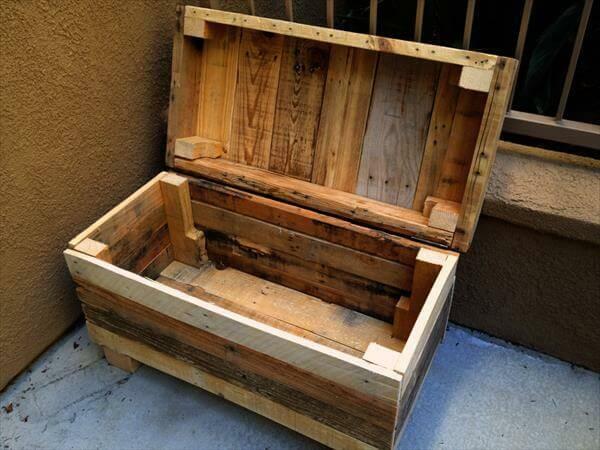 Pallets comes retired from the shipping companies mostly as wood waste, and these ideas are ideal suggestions and recommendations to reduce this wood waste while getting adorable furniture objects for your home out of them! 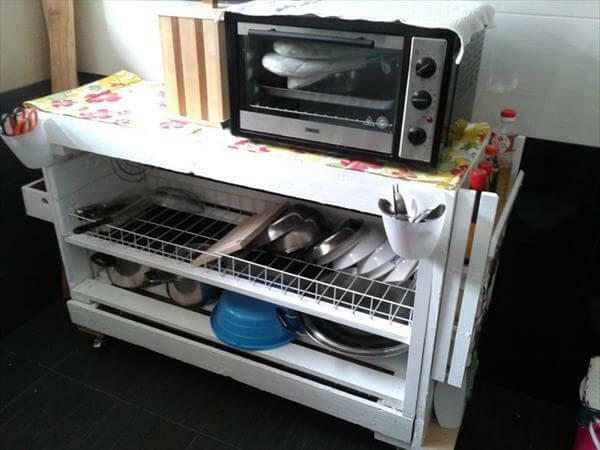 Live more with pallets instead of making them burnt in your stoves! 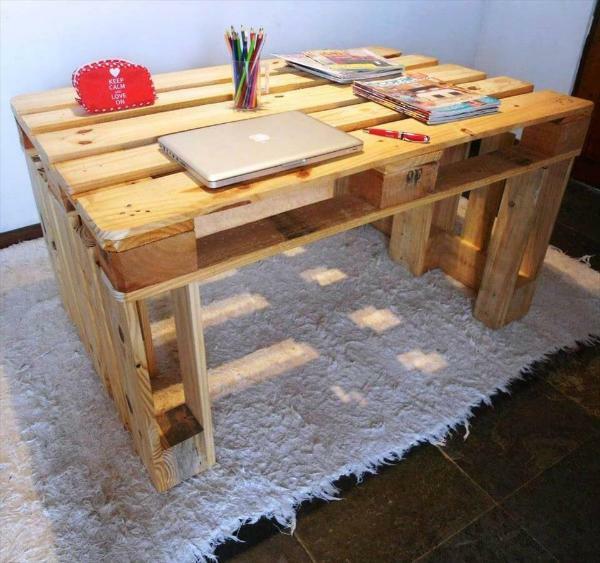 These ideal pallet furniture projects are truly going to make you fall in love with pallets! Ideas give you a comprehensive look about how you can turn the pallets into other functional shapes that would be life-changing! 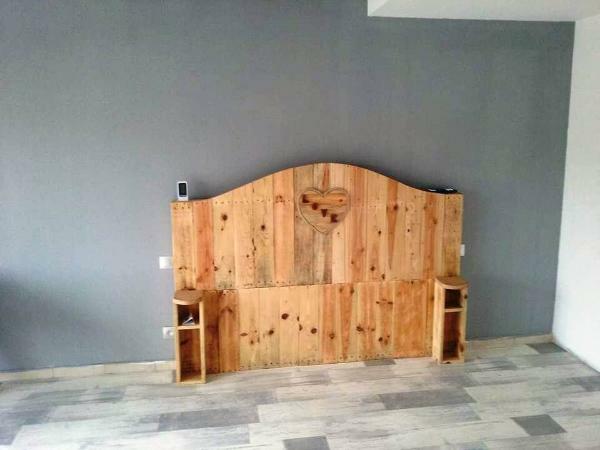 Bypass the stylish storage and sitting furniture with pallets without getting expensive and get crafty also with pallets for getting outstanding decors that will create stronger decorative look of your dwelling! 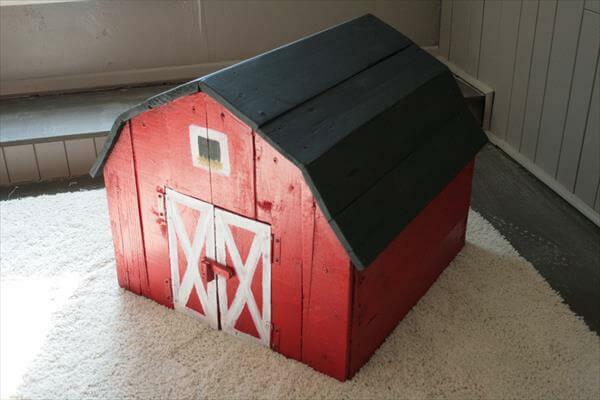 This given collection is going to encircle all the latest and most appreciated pallet projects that will put your life on a functional and luxurious track! Something very innovative here, a precious pallet headboard built with hands and comes with amazing features like the side storage pockets and flat surfaces for placement of night supports! Camel back design will inspire all! 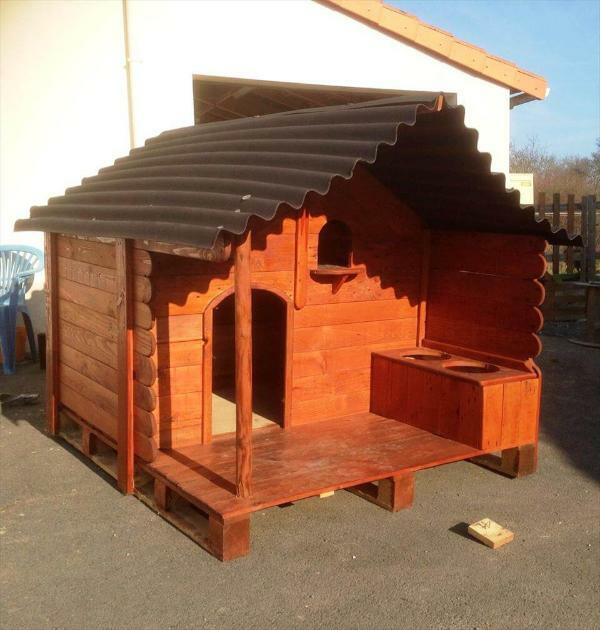 Go handmade with pallets if you are all willing to house your pets well, this large dog house may be a great suggestion here to get your inspired, comes with chevron metal roof and also with installed dog feeder in the veranda! 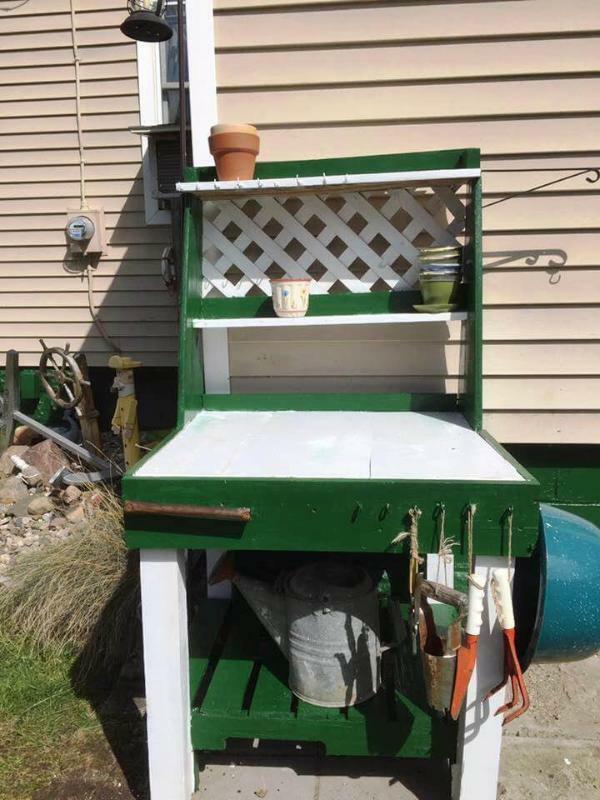 Let the pallets help you while improving your green spaces or gardens, presenting here the beautiful wooden potting bench, beautifully made to provide a work space, some storage space and also some display space for the garden pots! 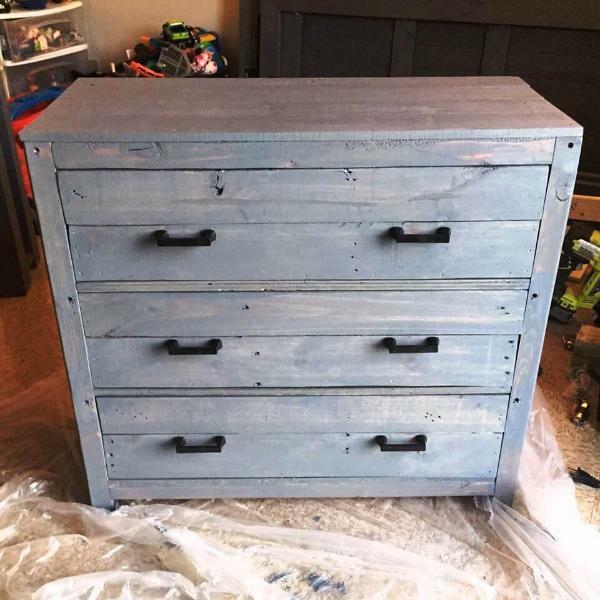 Beautiful wooden chest of drawer, a significant pallet creation, done to solve the storage space issues of a home without spending too much! 1 removed pallet dice section with 2 drawers fitted in the openings, has also been mounted over the wall as a storage-friendly shelf! 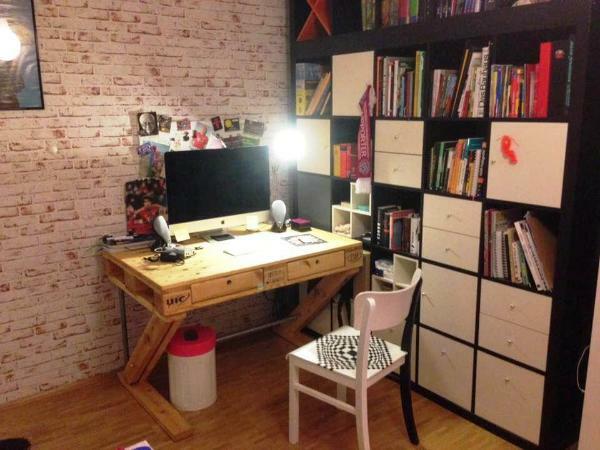 A beautiful pallet gift for students who are media entertainments too, a stylish wooden desk built for both study purposes and also for computer or laptop operating purposes! It gets the whole elegance from Z-shape sides or legs! 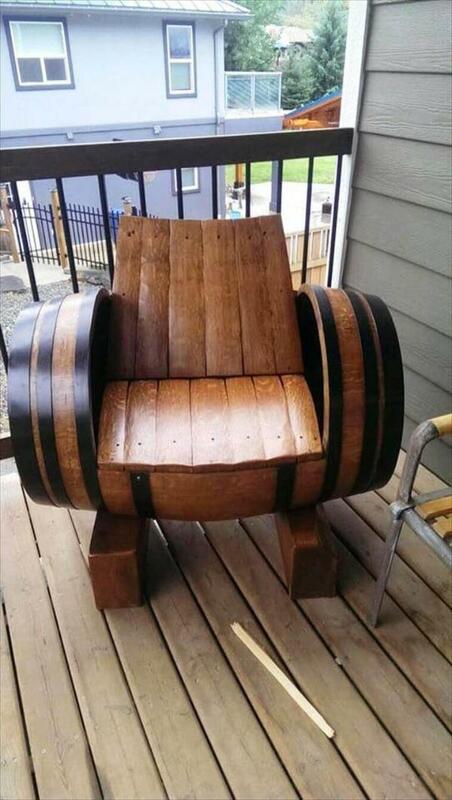 Restructure old wooden barrels for new functional objects even the furniture pieces, what you say about this handsome wooden barrel chair? 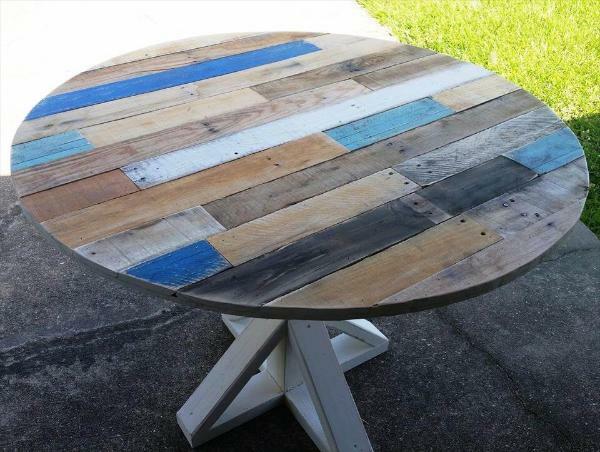 Get crafty with pallets also for ultra modern and stylish furniture but with a damn gorgeous rustic touch, here is this beautiful round top pallet coffee table with arty style pedestal base, done by getting creative with single pallet slats!! 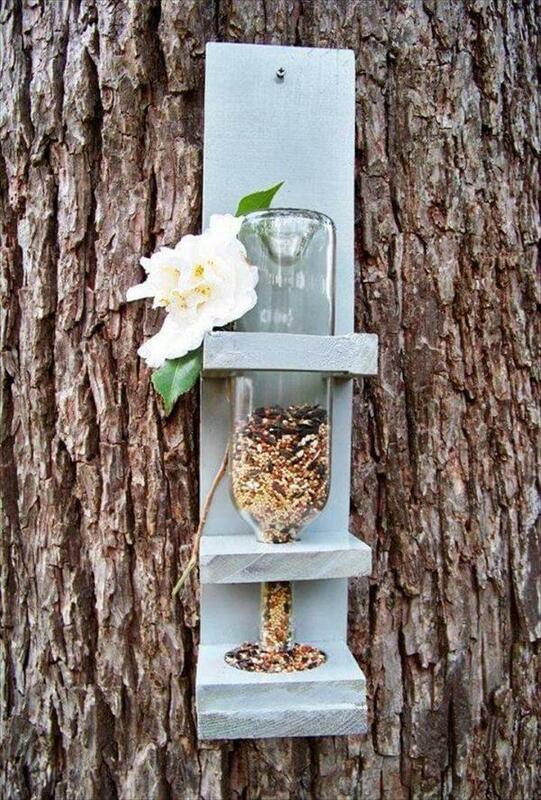 Recycle pallet wood scrap also for little but functional objects like this garden tree bird feeder, has entirely been made with some of single pallet slats and an old glass bottle! 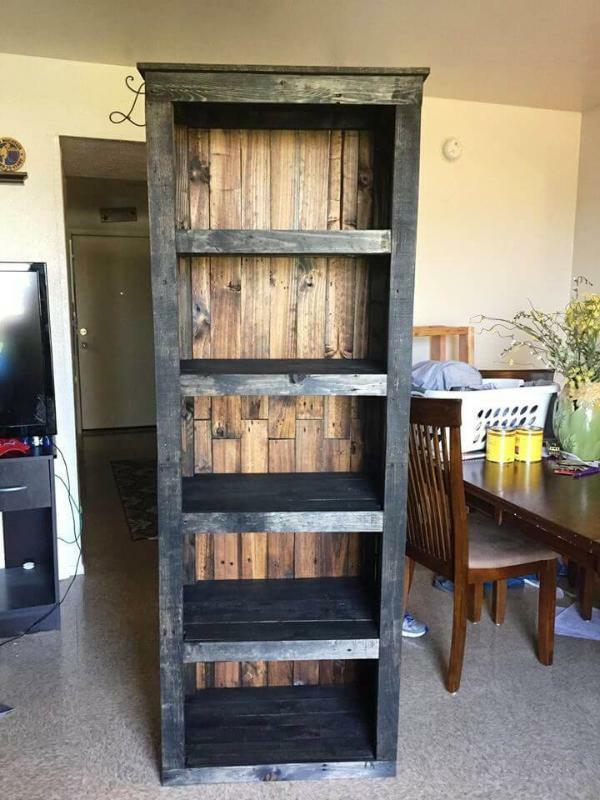 Lovely wooden shelving tower, done with pallets and has been intended to use as a display unit or a beautiful bookcase, another ingenious pallet achievement! Gorgeous wooden chest of drawers, built in smaller dimensions, can be got to place in sides of a bed as a rustic yet stylish wooden nightstand! 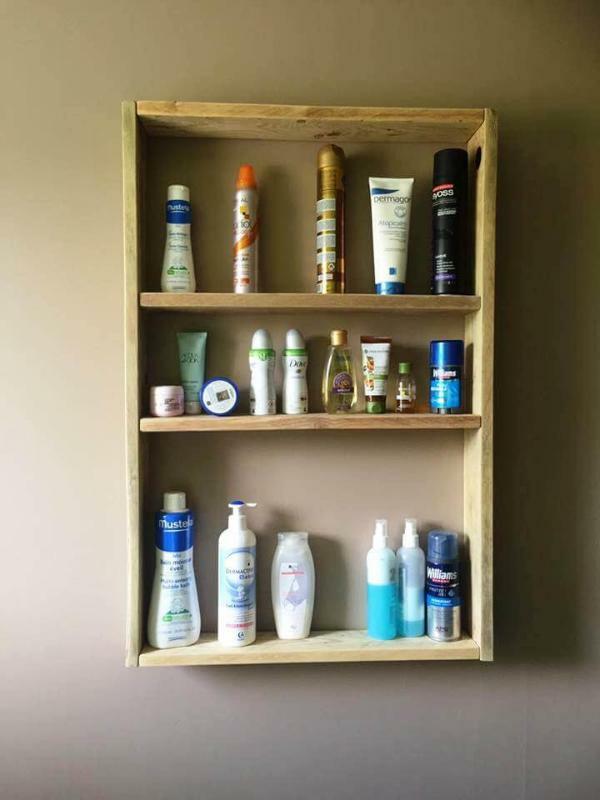 A few of pallet slats have been installed to a bathroom wall area to gain a beautiful shelf or organizer for toiletries, get your bathroom interiors functional with pallets! 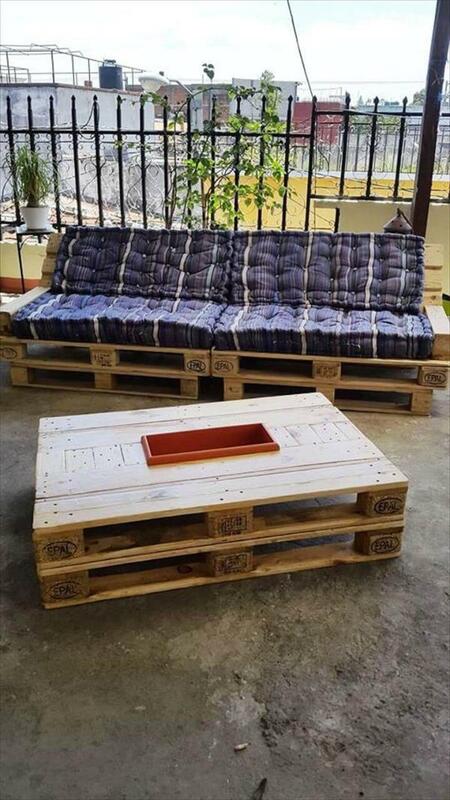 Simple arrangements of pallets can also make you get the amazing furniture outputs, here seats has been done using 3 complete skids of pallets while side table has been installed with torn apart slats of pallets! 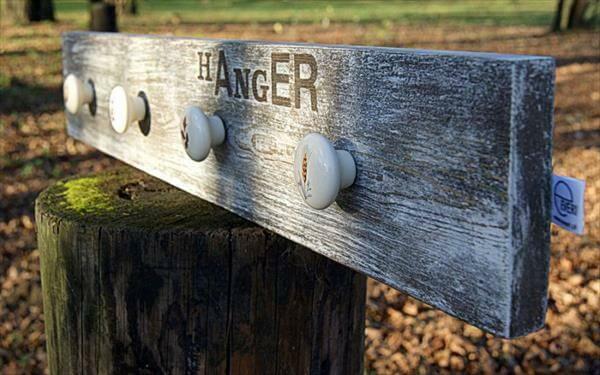 Sit in style at outdoor, just have this robust wooden desk to sit anywhere at outdoor, completed with 2 different types of old wood, pallets and old cable spools! 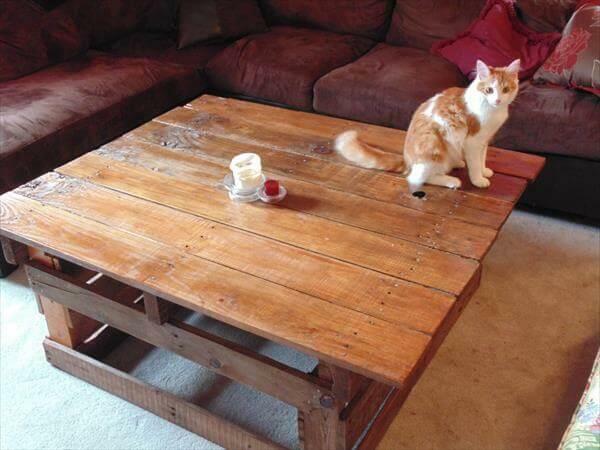 Make this lovely low coffee table duplicated using pallets, grab the pallets which are having sizes equal to tabletops and then just raise them on hardware rolls after some creative modifications! 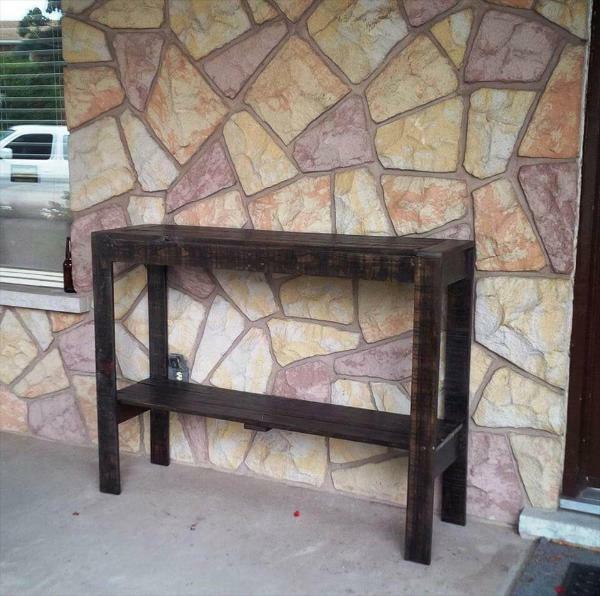 Rustic wooden console, perfect for interior or exterior entryways, would be all easy to compose with single pallet slats so just get them to get a copy of it! 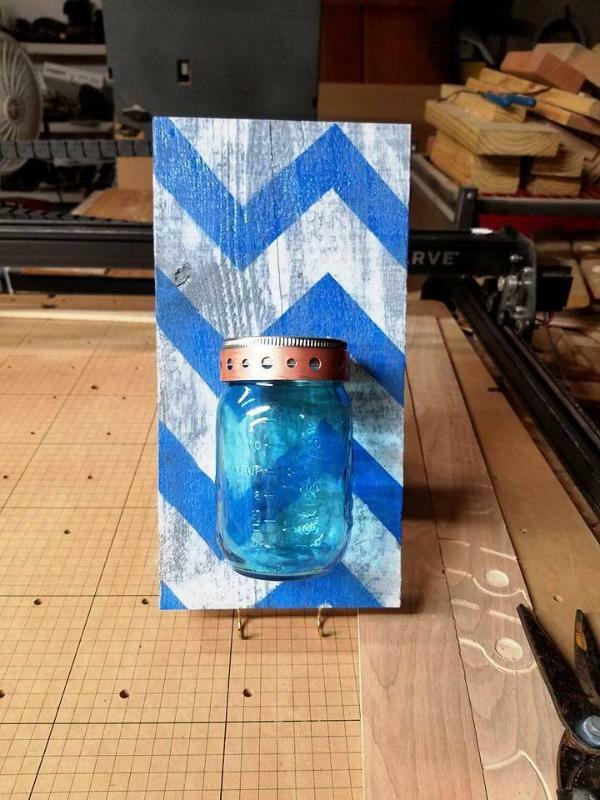 Cool wall vase or organizer, made of a single pallet length painted for blue and white chevron lines, and with a Mason jar fixed in the center using a metal pot holder! Here a robust wooden table has been recovered from pallets and a matching has also been installed to sit around this table for eating dinners or snacks at outdoor! Entire table and bench set has been finished nicely for lasting weather protection! 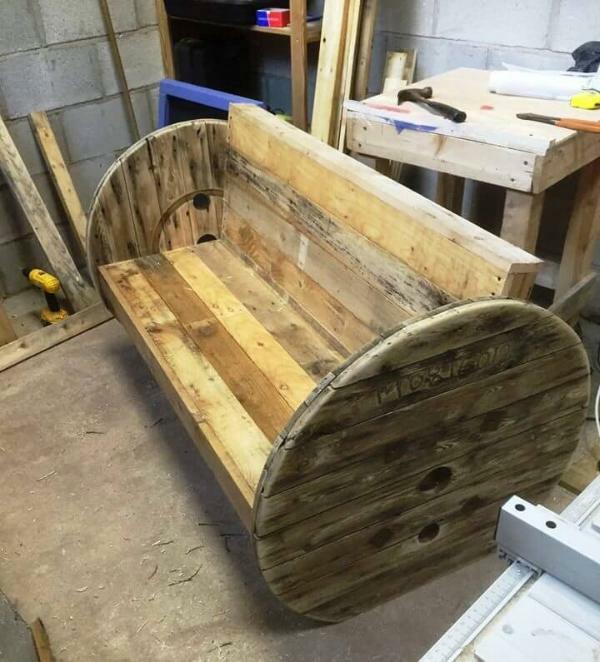 Reclaim pallet scrap to build this awesome toddler chair, here resized pallet slats and removed stringer boards have been put together for this cool toddler chair! 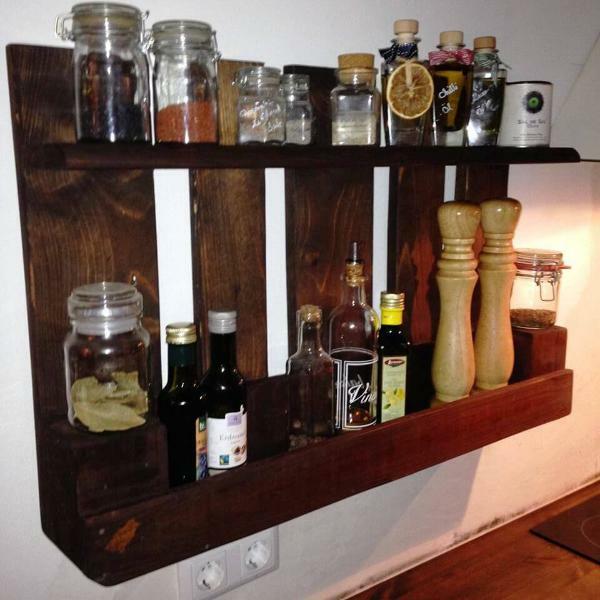 Another flawless pallet recovery, a beautiful gift also for beverage lovers, stunning wooden liquor shelf or mini wall hanging beverage bar, stained for a brilliant choco tone of wood! 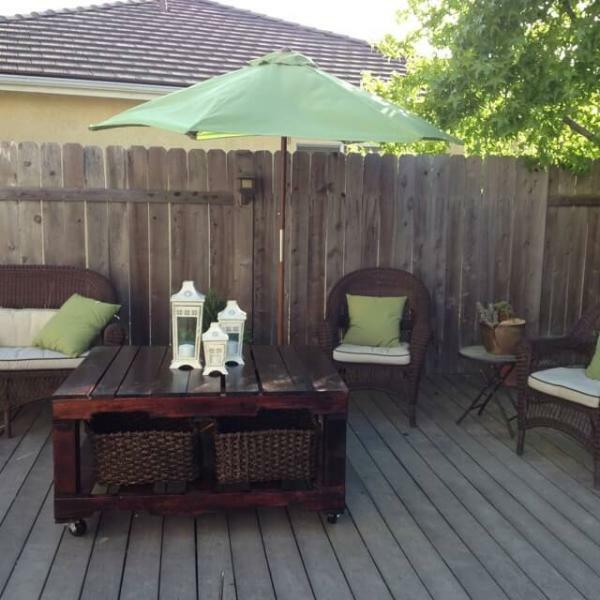 Here is a perfect inspiration if you want to jazz up a newly built terrace or want to organize a home deck or just willing to spruce up a patio! 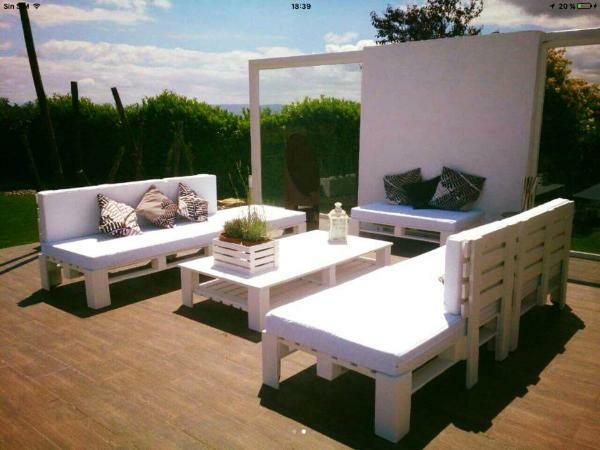 Beautiful pallet outdoor furniture cushioned in white! 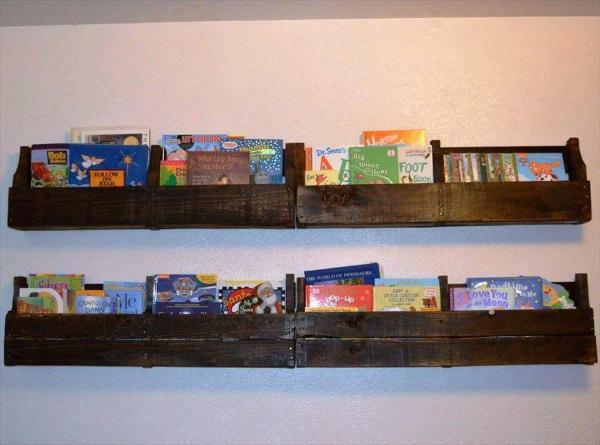 Separate apart the exclusive built in parts of pallets which can just be hanged on a wall area as beautiful display or storage shelves, get inspired of these beautiful magazines pallet shelves! 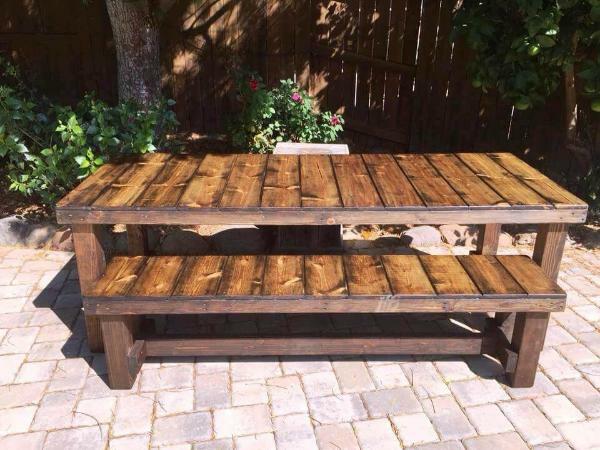 XL wooden dining table, made out of pallets and has a pure rustic wooden visual! Perfect for occasional dining and sitting purposes, can also be hired as a conference table! 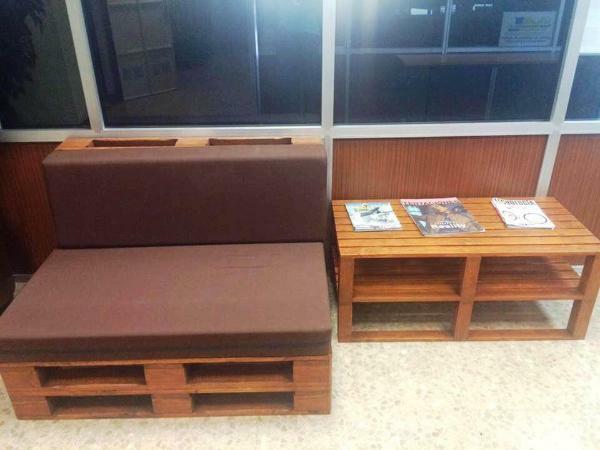 Another great sitting furniture project done with Euro pallets, 2 cushioned 2 seater benches and a icebox coffee table are the total assets of this no-cost sitting set! 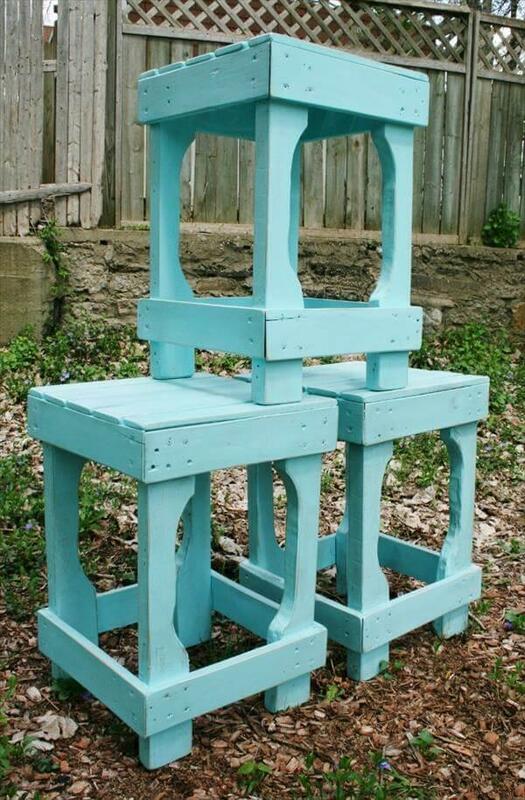 Simply stack pallets to clone this sitting set! 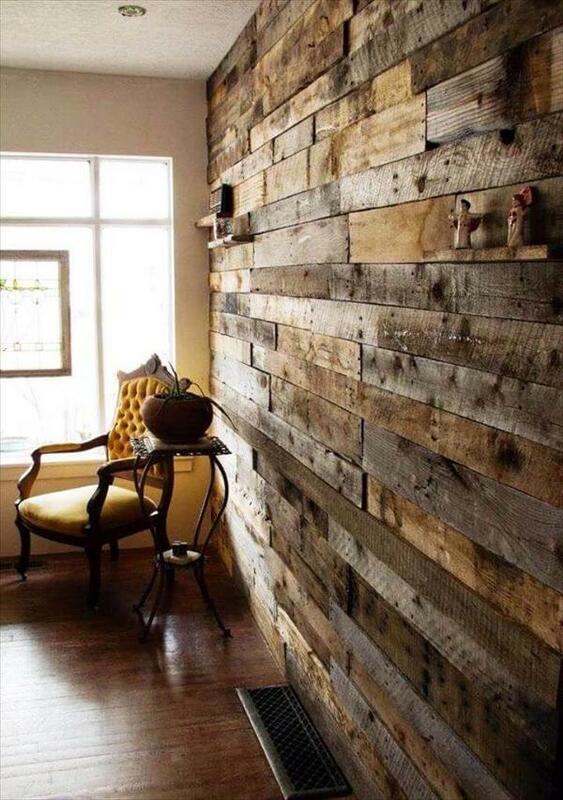 Rustic wooden pallet wall, done for a glam vintage touch to a modern room interior, can further be spruced up in several different ways depending on your creativity! It is also a low-cost way to get your room interiors insulated! 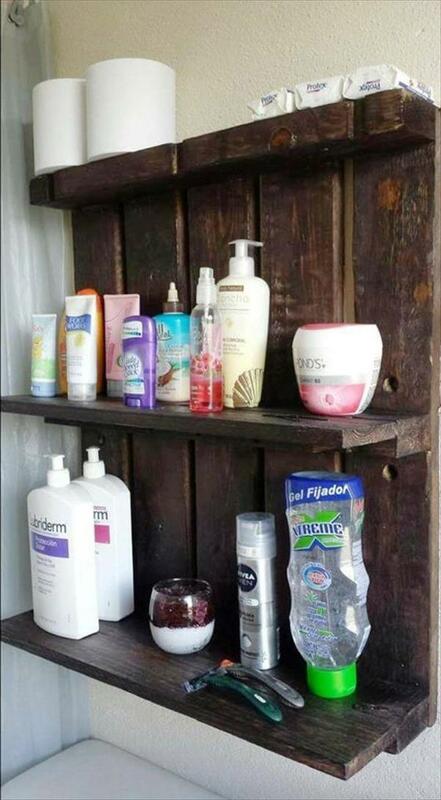 A single pallet has been altered ingeniously here to gain this rustic wooden toiletries organizer, provides 2 shelves and a tiny thicker top that can easily hold the toilet paper rolls and extra soaps! 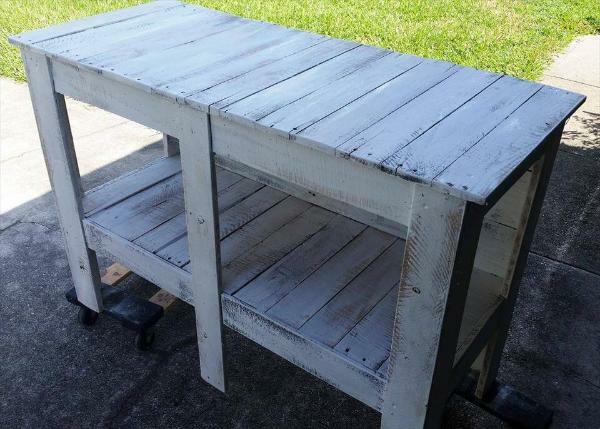 1 Complete pallet skid here has been raised on 2 pallet halves, this gives a stunning wooden desk that can be used for study purposes or for convenient operating of laptop and computer! 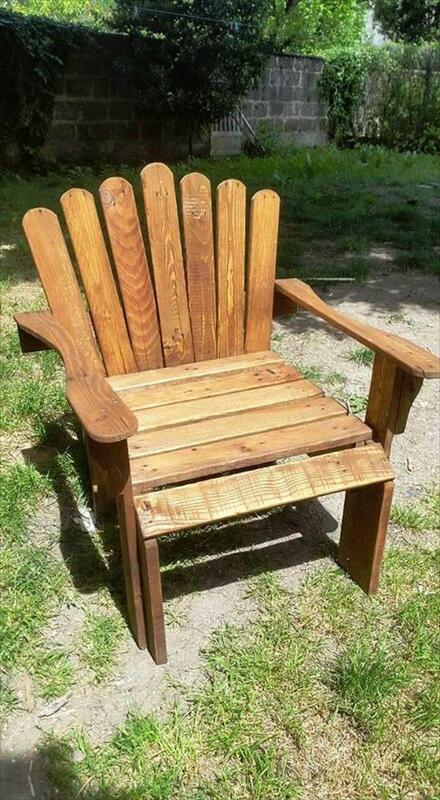 Enhance your outdoor sitting experience by getting free of cost yet stylish wooden chairs out of pallets! 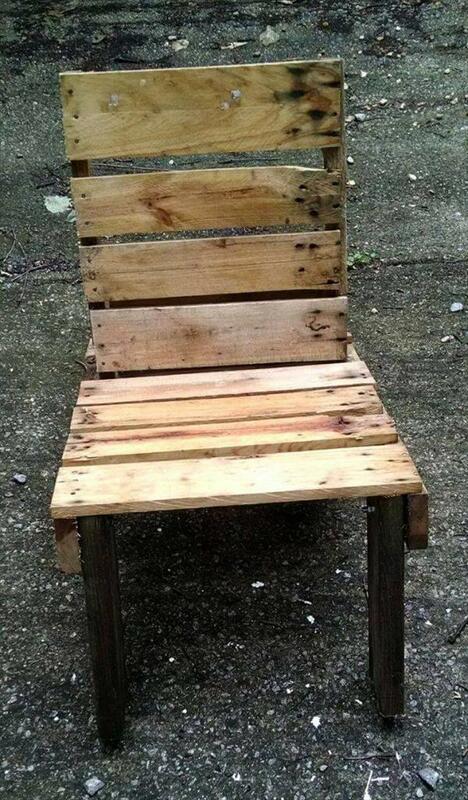 Given chair is also made of rustic pallets and is having a design inspired of an Adirondack chair! 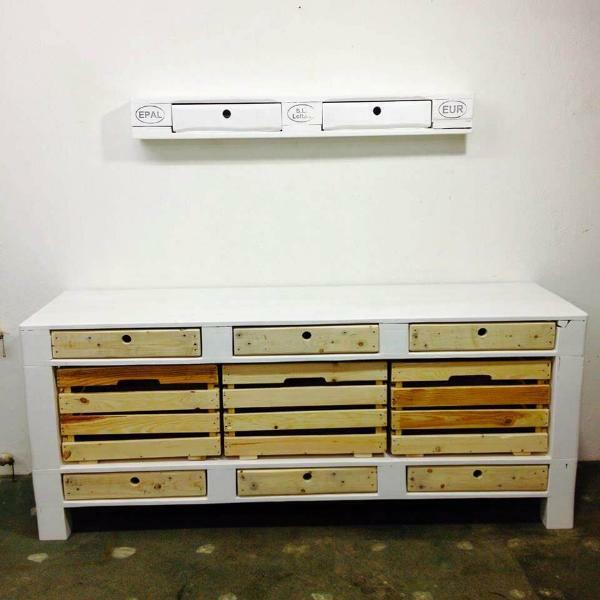 Distressed white wooden console installed with pallets, and comes with a lovely top, a lasting lower shelf and also with thicker legs that further stands on rolls having shape like the skateboards, also made of pallets and caster wheels! Prefer this pallet chair for a lovely and comfortable sitting position while enjoying the greenery all around and natural outdoor scenes! 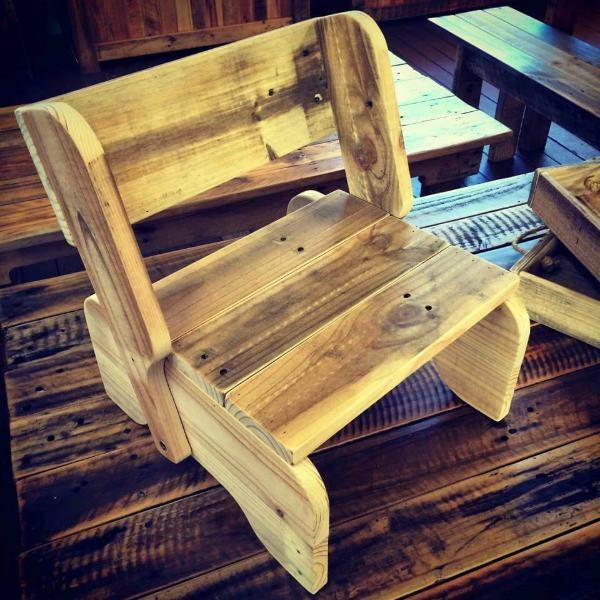 This hand-built pallet chair comes with a tilted back, a raised backrest and also with front legs only! 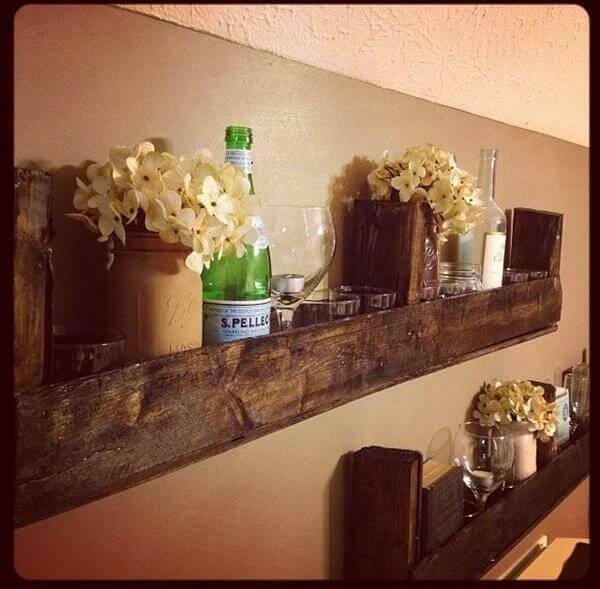 Awesome wall hanging wooden bar, recovered from retired pallets! 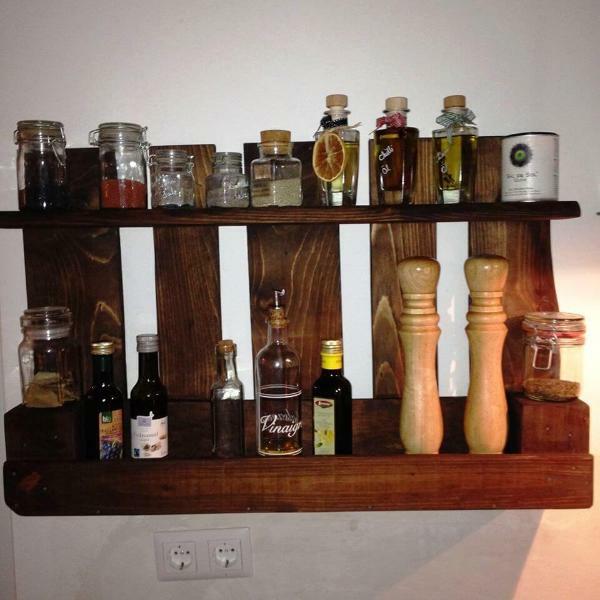 It would also be something highly precious to add to your indoor bar area to store, organize and display your liquor!